Dr Craig Berry has been appointed Deputy Director of SPERI from 1 January 2015. He has been a Research Fellow at SPERI since September 2013 and has recently been promoted to take on this new responsibility. Craig joined SPERI from the Trades Union Congress where he was Pensions Policy Officer. Previously he worked at HM Treasury as a Policy Adviser and at the International Longevity Centre-UK where he was Head of Policy and Senior Researcher. His current research focuses on the development of an alternative model of economic growth in Britain, following the apparent failure of the Anglo-liberal growth strategy which emerged in the 1980s. He will soon embark on a new research project on the political economy of the North of England. Craig is the author of Globalisation and Ideology in Britain: Neoliberalism, Free Trade and the Global Economy (Manchester University Press, 2011) and has recently published, with Colin Hay, a major new article in the British Journal of Politics and International Relations entitled ‘The Great British “rebalancing” act’. 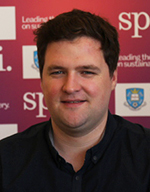 During his time at SPERI Craig initiated and now edits the British Political Economy Briefs produced at regular intervals by SPERI. Like all SPERI staff, he also blogs frequently on SPERI Comment: the political economy blog and other blogs. Older Have a very SPERI Xmas!